Most importantly--Is it done yet? 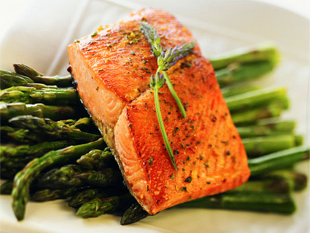 If its not grilling season and I am cooking for 2 people I almost always pan fry our salmon. Its fast and easy and only takes 6-8 minutes. Add a salad or greens and some rice and you have a delicious meal in 20 minutes. Who says eating healthy can't be easy? 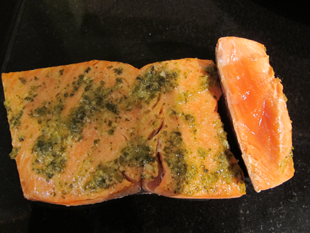 One of the many things I love about our salmon is how simple you can prepare it and still have it be delicious. No need for a sauce or cheese to make it taste good. With high quality ingredients all you really need is a little olive oil, salt and pepper and you are good to go! Rinse and pat fillets dry. Rub with olive oil, salt and seasonings. When I am grilling, I make the salmon my first priority. I know this may sound silly, but I don't even like to have a conversation with someone while I have fish on the grill. It cooks fast and it is super easy to overcook. I like to have a glass of wine and my timer set. I started this "timer rule" when I nearly overcooked 6 pounds of salmon at a dinner party. I had had a few drinks and was deep in conversation and nearly ruined dinner. If something like this does happen to you, whatever you do, don't point it out to everyone that the salmon is overcooked. Most people will still think it is delicious and probably won't even notice if it is a little overcooked, unless you point it out. This is our favorite meals. 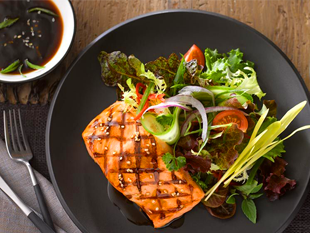 Grilled teriyaki salmon, a fresh green salad and rice with nori (seasoned seaweed) sprinkles. Light, easy and simple, this meal is always a crowd pleaser. You can find my super easy teriyaki recipe on the recipe page. 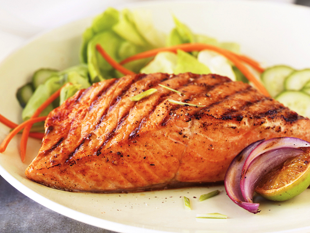 Cut fillets into meal-size portions before grilling. If you plan to grill a whole fillet I like to cut the tail portion off and grill it separately, as it will cook quicker than the rest of the fillet. I usually put the tail on a few minutes after the main fillet so that everything will come off the grill at the same time. Oil and salt the salmon lightly before grilling. Place the salmon skin side down on the grill. There is no need to flip. Unless you have a well seasoned cast iron grill or one of the really cheap portable grills with thin grates, the flesh of the salmon will most likely stick. To avoid the "sticking panic" cook salmon skin side down and don't flip. Grill approximately 8 minutes per inch of thickness. When removing from the grill slip the spatula between the meat and the skin and easily lift off. The skin will stick to the grill and can be removed later. If the skin is crispy, yet not burned we like to eat it. It is filled with omega 3's and is quite tasty. Rise and pat fillets dry. Oil and salt the salmon lightly before cooking. For easy clean up, line a baking sheet with parchment paper. Bake for 8-12 minutes depending on thickness. For easy clean up, line a non-metal dish with parchment paper. Broil 4-6 inches from the heating element. Broil 5-7 minutes or until salmon is done. No need to flip. Bring poaching liquid to a boil in deep fry pan or sauce pan. Once boiling, reduce heat to a simmer. Add salmon and cook for 6-8 minutes depending on thickness.